Bankruptcy Relief for Student Loans May Be Changing? Today, a legislator introduced a bill to treat student loan debt as other unsecured debt in a bankruptcy filing. This would be huge! As everyone knows, a bill isn’t a law and it could be awhile, but if this gains steam, we may have some relief for graduates over the past 20 years who are facing student loans that the new governmental forgiveness programs don’t cover. 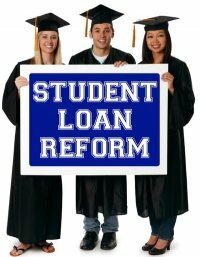 Rep. John K. Delaney, D-Md., introduced the Discharge Student Loans in Bankruptcy Act (H.R. 449) on January 22, 2015. The bill itself can be found here. This link can also be used to track its progress through the House, Senate and finally the President if it makes it through. I just checked the link and the text of the bill isn’t up yet, but it should be in a couple days. I’ll be curious to see how it is worded and other legal commentators’ opinions of its likelihood of passage. Presently, the burden to discharge student loans is not easy. The Brunner standard of what it takes to show an undue hardship is very difficult to meet. However, this 1987 case is starting to come under fire because of the impossible standards imposed. Over the past year, there have been approximately a dozen federal cases providing a framework for a new standard allowing for discharge of student loan debt. Brunner has some competition now. Times are different now. In 1987, people didn’t have the student loan debt they do nowadays. Also, there was the ability to discharge private student loans that no longer exists. Finally, when Brunner was decided, student loans that were older where payments had been made for a period of years were dischargeable. Congress amended Section 523(a)(8) allowing for undue hardship of student loans several times after Brunner, each time narrowing the window. With the public outcry over massive student loan debt that exceeds credit card debt it may now finally be time for a change. Too many former students cannot afford to get married, or have children, or buy houses. Their lives are on hold due to excessive student loan debt. The standards can met nowadays, but it takes a very specific fact pattern. Preferably a debtor who has some kind of medical impairment or cares for someone who is disabled. Without that, it can still be possible for a partial discharge for someone older, or even younger who has not been able to obtain work to maintain a certain standard of living for a long period of time that is anticipated to continue for the indefinite future. Someone young, healthy, in a good job with unknown future potential need not apply. Someone in that position with $100,000 in private student loans with no programs to assist them is likely facing default, lawsuits and wage garnishment. Reasonable limits on dischargeability is what we need. I agree that most people should repay their student loan debt. However, for a student that can barely make their rent and car payment, there needs to be some relief. There are governmental programs now for federal loans that are pretty good. But nothing for private student loans. Nothing but a debt collector calling every day (which reminds me, many of their calls can be violations of consumer protection laws allowing for statutory damages of $500 or up to $1,500 per violation in some cases). So the bottom line is bankruptcy reform would definitely help the ones who presently are left out in the cold and no time is better than now. For more information, please contact Florida student loan and bankruptcy attorney Christie D. Arkovich, P.A.